skytee making things do stuff. 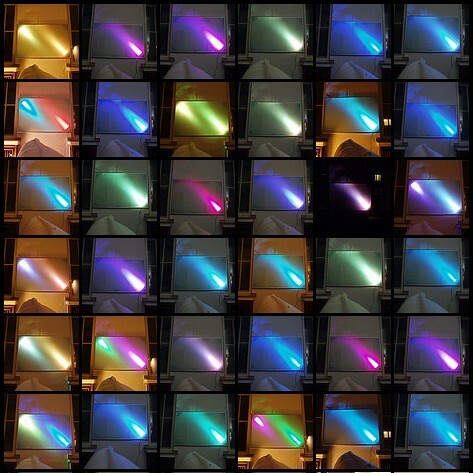 Make your own color changing RGB backlit whiteboard: useful in daylight and pretty at night. For extra coziness while working late hours in the lab (video). I needed a whiteboard and had this spare table top: frosted glass plate with an aluminum frame. While putting it up onto the wall with two strong hooks, I thought it would make a great diffuser for a lamp. Let it be a white board and a source of indirect light in arbitrary colors. And that's the idea of my FnordBoard. To make a backlit whiteboard, a FnordlichtMini is a perfect match. That's an inexpensive Open Source RGB color changing LED hardware, based on an Atmel AVR ATmega8. Several of these can be chained up and individually controlled. Since my whiteboard should be backlit, one or more of those shall be mounted on the bottom side of the table top. It should shine right across the glass plate, so a lot of light would be diffused. The table top is actually an IKEA Vika Lauri. The bottom side is frosted, the top side is easy to write on with a whiteboard marker. The frame is held together by each a metal plate and four rivets in each corner. The bump in the middle of the plate has an M10 thread to attach a leg onto. How to mount it now? I had some of these white plastic caps that come e.g. with IKEA Expedit book cases . (One is supposed to affix these shelves with a metal brackets to the wall, covering each bracket with a plastic cap.) Conveniently, one of these RGB color changing lamps just fits onto one of those white plastic caps. Even more conveniently, when sliding a plastic cap under one of the metal plates holding the table top frame together, it just fits under the threaded hole so you can bolt it down. With the plastic cap bolted down, a FnordlichtMini can be attached to it. You might want to use a bolt for this, since the PCBs have mounting holes. Last step: add power cabling. That can be drawn along inside the mortise of the aluminum frame. Supply voltage is 12V DC. Attach to wall and enjoy! The Fnordlicht project started out as a kit used for teaching young people electronics and programming. Several of these can be chained up to a bus using inexpensive ribbon cable. They will take commands via a serial interface attached to the first of the chain. Check out the protocol: they can each display an individual color and change color quite rapidly. @fbz made an incredible DJ desk installation including 40 of these, controlling each one separately by music via processing. Check out fd0's Fnordlicht page for more. cool, but it’s a pitty that you can actually see the light behind the board, instead of the entire board lighting up…. Thanks for your feedback. I am currently playing w/ diffusers in front of each FnordlichtMini. Also white paint on the frosted back should provide a more even diffusion and better contrast when writing on it. Hi, you should consider taking advantage of snell’s law to create a “fiber optic” backlight, the same way that computer LCD monitors do it. You just need to put a line of light pointing up through both longer edges of the whiteboard. So a strip of small LEDs would work well. If you position the source of the lights at the right distance away from the edge of the glass, the light will be completely “trapped” inside of the glass and will evenly illuminate it from behind. Its referred to as total internal reflectance – the same theory that makes fiber optic data work. Unless specified otherwise, all posts are licensed under this Creative Commons license.